If you haven’t heard or tried Tres Leches Cake before, you haven’t lived in my humble opinion. Seriously though, Tres Leches (3 milks) became popular in Latin America and has evolved into a standard celebration cake. It is a very rich cake, with a light and airy sponge base, followed by 3 types of milk (leches), condensed milk, evaporated milk and heavy cream. Now tell me, who does not like condensed milk right out of a can? As you will see from the ingredients, this cake is rich, decadent, calorie-laden, sinful, but oh so satisfying! This was my first attempt at trying this cake; I had tasted it a few times before and really fell in love with it. I thought I’d bring it to our friend’s brunch farewell party. I wait for opportunities such as these to try something “sinfully outrageous” and this definitely was very well received, and no……. I do not make desserts on a regular basis for precisely this reason, so allowing myself some treats every so often works! I wanted to decorate the cake in many ways, but I did not think it would actually make it through the journey. Combine flour, baking powder and salt in a large bowl. Separate eggs. Bake for 35 to 40 minutes or until a toothpick comes out clean. Turk cake out onto a rimmed platter and allow to cool. Combine condensed milk, evaporated milk and heavy cream in a small pitcher. When cake is cool, pierce the surface with a fork several times. Slowly drizzle the milk mixture – try to get as much around the edges of the cake as you can, as the edges can get pretty dry. Allow the cake to absorb the milk mixture for 30 minutes. To ice the cake, whip 1 pint heavy cream with 3 tablespoons sugar until thick and spreadable. Spread over the surface of the cake. Decorate cake with whole maraschino cherries or any type of fruit or even chocolate shavings. Cut into squares and serve. I’m taking this dish to Fiesta Friday # 73 where each week Angie and her co-hosts welcome us in a virtual setting. It is always fun to see who is around and sample the offerings. Thanks to Michelle and Juju for co-hosting today. Click on their blogs to see the wonderful display of dishes today. I have just started hearing about this cake, and while sinful, it looks totally worth the splurge. I would say your first attempt was an amazing success! I am going to jump on this band wagon and make one soon. I usually pour water in my emptied sweetened condensed milk right away so I don’t go slurping up what’s left…I am weak! Actually Loretta we just returned from vacation and I was very weak! Too much wine and it showed on the scale . Arghhh. Ha ha Sandhya, that’s too funny! It would have been great though, you could bring your mango dessert (that I will be trying one of these days), and we could both pig out and get acquainted :)). The condensed milk is so sticky, so there’s a good portion that sticks to the side of the can, so before disposing of it, I like to make sure it is clean LOL! Love the cake Loretta, tres leches is so moist and delicious. I could probably eat half the cake with a spoon, it looks really really good. I heard about this cake, but unfortunately I didn’t have the chance to taste it! But, I am sure you are right Loretta, I’ve missing something! I’ve had it in NYC, my friend recommended it but I found it too sweet and I love my sweets, don’t get me wrong… maybe it was a different kind of tres leches. Yeah I love condensed milk too. There was something that didn’t sit well with my taste buds and I was disappointed bec I’ve heard it was supposed to be so good! Non only have I heard of Tres Leches Cake, but also, I love it when it is well made. One look at your cake, my mouth started watering. Yum! Decadent favorite of mine. Can’t wait to see you try the mango version Loretta! So gorgeous too! One of my favorites Loretta! Looks gorgeous & so moist! Yum!!! Saving this recipe. Thank you, I know I will love this cake. I printed it out. I love that feature on your recipes. Love this cake! I discovered it recently and am a big fan now! Your tres leches cake looks awesome! How tempting with that inviting display ready to be picked up! Thanks, it is wonderful isn’t it? I too became a fan not so long ago, but knowing how rich the cake was, I didn’t want to tempt myself making it at home. So this came in handy when I took it to a Farewell event. Take all your heart desires Jhuls, it is a dessert you won’t want to miss, and 2 pieces did it for me too :). Happy weekend! Tres Leches Cake is my absolute favourite, in fact I don’t make it unless I know I can send most it of it off somewhere else since I WILL eat the entire cake if it’s left in my fridge! This recipe looks absolutely delicious Loretta, I could go for a huge slice right now! Thanks so much for sharing it with us at Fiesta Friday! Same here Michelle, I could not trust myself with the leftovers. I made it for a farewell brunch, so at least it was out of my house :). This was the first time I made it, if I make it again, I’d love to decorate some more perhaps with mangoes and some mango pulp in the mix too. Yes adding mangoes would be an amazing addition! I hope you’ll share it if you do that! 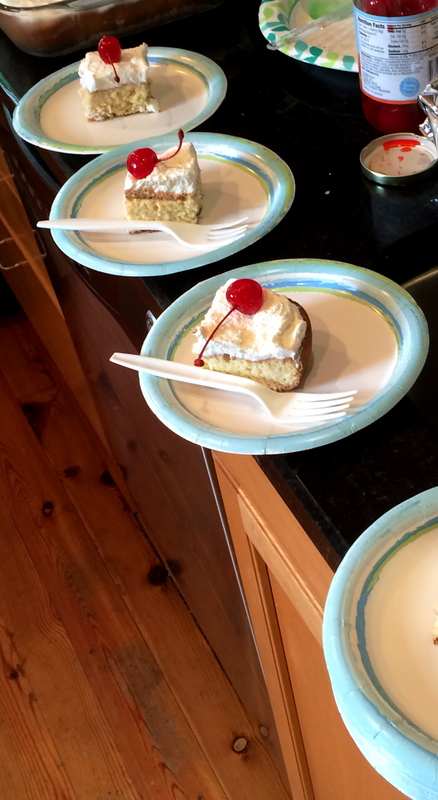 Thanks Lili – I recall that you had a Tres Leches week not so long ago? Made it for the first time and loved it, I’ll experiment with it a bit more on the toppings the next time. Thanks to you too Freda, I stumbled across your blog and saw that you are a “fellow Goan”, so naturally I was curious to see what dishes you were putting forth. I have one of my posts on Goa and the food and culture as so many folks in the USA have not heard of Goa. Welcome to my blog too, I should be getting your future posts, so looking forward to it. I have been wanting to make one of these cakes for the longest time. I keep hearing about it, but have never tasted one. Yours looks incredible! I definitely have to try this.